for those at Sarasota and at home! At Upwind, we want to engage people in hyping the Mixed and Women's division while also building wealth for women in ultimate, so we've come up with the above schedule for Nationals (and in more depth below), which includes a fantasy bracket, a gender equity scavenger hunt, and live interviews with players. 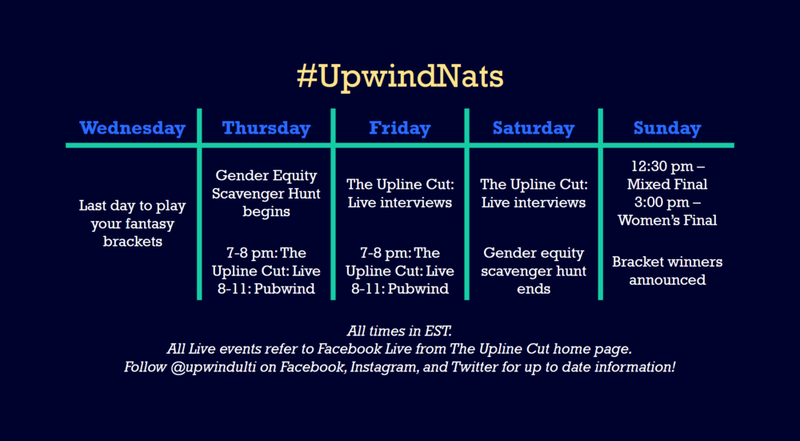 Follow along on our social media (Twitter, Instagram, and Facebook) @upwindulti! Student & Youth 50% Discount when you enter your team and school name at check out. The gear prizes are also available for sale at our Store. Gender Equity Scavenger Hunt begins! Thought you knew everything about gender equity? Participate in this scavenger hunt at home to find out. Entry cost is $5 per team, and you could win a customized flag for your team made by 5 Ultimate. Teams at Sarasota: We'll release a separate scavenger hunt for you to complete at the fields. Winning team will receive homemade brunch on Sunday morning. The Upline Cut: Live! We'll be hosting The Upline Cut at our apartment in Siesta Key, and we'll also be on Facebook Live so you can watch from the comfort of your homes. Join us at 7-8 pm EST. Pubwind: Those in Sarasota, please join us at our apartment from 8-11 pm for drinks and informal conversations on equity. Thursday's focus: what's in it for me when it comes to the equity conversation? The Upline Cut: Live! We'll be hosting another episode of The Upline Cut! Tune in at 7-8 pm EST. Pubwind: Those in Sarasota, please join us at our apartment from 8-11 pm for drinks and informal conversations on equity. Thursday's focus: what does #BlackLivesMatter mean and how can we be intersectional gender equity advocates? Join us on social media again as we do live interviews throughout the day! This is also the last day to participate in our Upwind Gender Equity Scavenger Hunt! Winners will be announced in the evening. Tune in to watch the Mixed final at 12:30 pm EST and the Women's final at 3:00 pm to see who will take home the grand prizes for the Fantasy Brackets!